espite Dickens's use of a hulk in the opening chapters of his 1861 novel Great Expectations and his having convicted felon Abel Magwitch return from a life sentence, the British government ceased to employ hulks on the final expiry of the 1776 Act in 1857, fully four years before Dickens published the novel. The hulks were not, however, an anachronism when Cruikshank developed the sixth and seventh plates of The Drunkard's Children. Just the year previous, the state had attempted to distinguish between child criminals, young offenders, and hardened criminals by passing the Juvenile Offenders Act (10 & 11 Victoria, c. 82), so that a magistrate could, at his discretion, discharge an offender under the age of 14 if the charge were larceny without violence. Cruikshank does not specify the nature of the son's offence, which apparently involves "a Desperate Robbery" (Plate IV), but not necessarily murder. 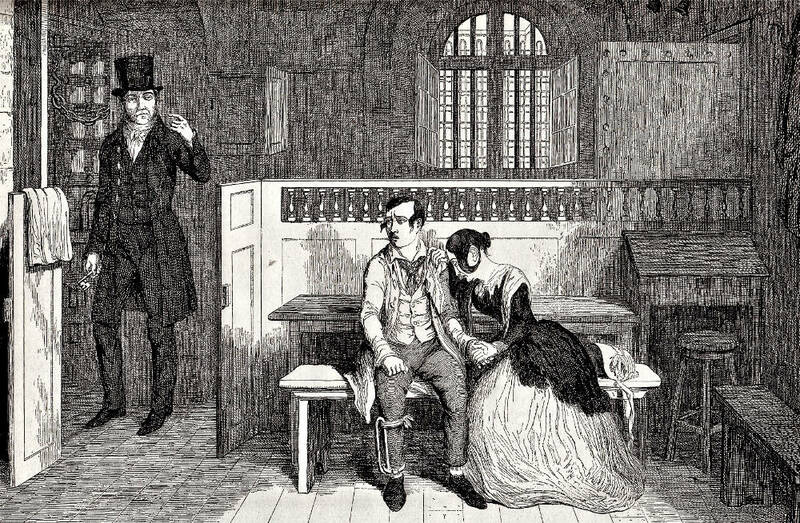 In the first series, The Bottle, Cruikshank describes the son as a mere child until the final illustration, in which he appears to be a teenager, so that, by the time he is indicted for larceny, he is beyond the magistrate's being allowed by the new statute to exercise summary disposition and discharge the boy without any punishment. After all the lively crowd scenes suggestive of the young criminal's revelling in the proletarian culture of London to the point of self-destruction — the gin-palace, beer-shop, dance-hall, lodging-house, and Old Bailey criminal court trial, the boy's final appearances in George Cruikshank's The Drunkard's Children (1848) gain intensity from the small cast of characters and the spartan features of each of the rooms — the visiting room of the prison and the infirmary on the hulk where the young man, convicted of larceny, dies. The boy's death will be recorded in the surgeon's log, the girl's as yet another prostitute who committed suicide in the local papers. 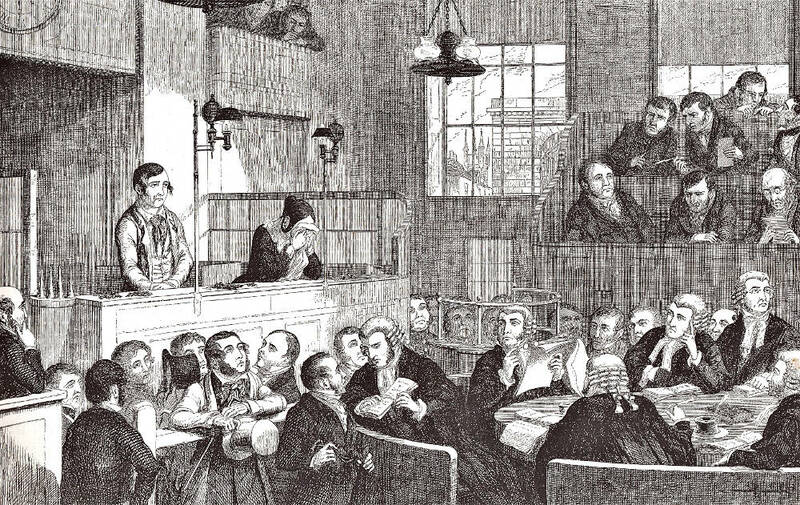 By the time that Cruikshank composed The Drunkard's Children in the late 1840s, being a "returned transport" was no longer a capital crime: the last convicted felon to face the death penalty for returning "from Australia was hanged in 1810, and the offence had not been a capital one since 1835" (Tony Williams, p. 8). 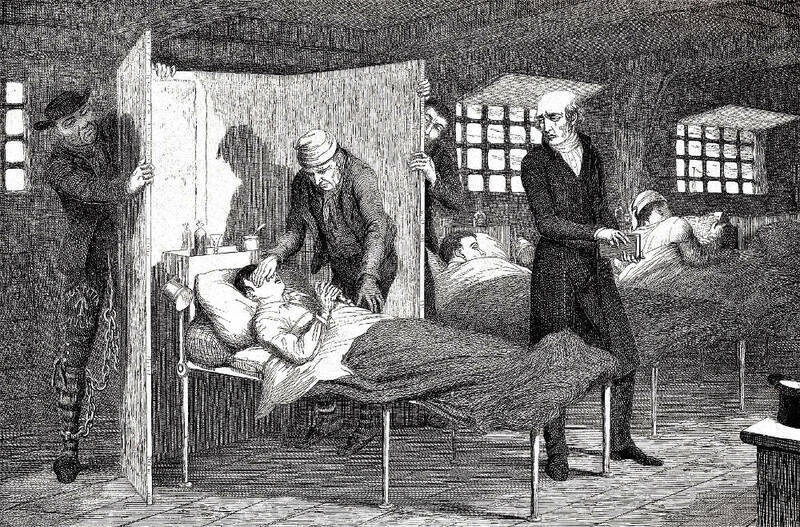 In every way, then, Cruikshank has made his young protagonist the subject of an inflexible inhumane, antiquated system: sentenced to life transportation for robbery, he dies (probably of typhus or cholera, but perhaps of cirrhosis of the liver) aboard a hulk, and never gets to see Australian shores. Dickens, Charles. Great Expectations. London: Chapman and Hall, 1861. Williams, Tony. "Over the Seas and Far Away, or the English Gulag — Transportation and the Hulks." The Dickens Magazine. 1, No. 1 (2000): 8-9.